She played in Amy Driver’s Dollar Baby The Deathroom as Mary. 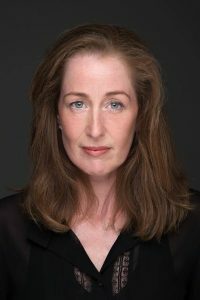 Sharon Skerritt: I’m an Irish actor who has worked in theatre for over 20 years but I have only worked in film for the last 7 years. SKSM: How did you become involved in The deathroom Dollar Baby film? Sharon Skerritt: I had previously worked on a student film Bare Walls and Amy Driver was part of the crew. When she was filming her versión of Willa she cast me in a small role and lucky for me she called me again for The Deathroom. Sharon Skerritt: I think it’s the old male fairytale – Oppressed man overthrows his oppressors. Everybody loves to root for the underdog. Sharon Skerritt: Em no but I had auditioned for a different film which Amy was AD on the part wasn’t written for me either. SKSM: You worked with Amy Driver on this film, how was that? Sharon Skerritt: Great! Amy is a super director to work with. Patient and warm in life as she is on set. Sharon Skerritt: Well it was so cold I fell asleep sitting on a bale of hay while waiting to film a scene! Sharon Skerritt: I knew Shane Casey from outside of the acting world so keep in touch with him and Amy via social media. Sharon Skerritt: I’m currently working on two theatre pieces I am writing and producing which will hopefully be staged next year. Filmwise I have roles in a Sci Fi called Rain and a Horror Film called RedRoom which are doing the festival rounds at the moment. Sharon Skerritt: I’m an 80’s kid, Close Encounters was a highlight of my childhood and IT. I think I read everything King had to offer during the 90’s so yeah I’m a fan……who isn’t? Sharon Skerritt: I’m incredibly shy!